Made this for my own challenge. The challenge: start at the KSC and drive towards the north pole using 50 units of fuel. Rover wheels are not allowed, only landing gear. The car is to be powered by a jet engine. 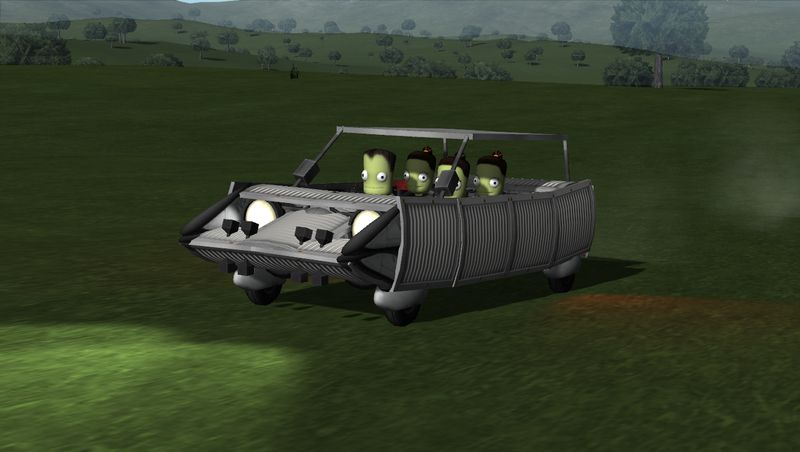 Required: 4 kerbals in seats and two science containers. The use of a boost flap is encouraged. Mechjeb is encouraged for use of the rover autopilot. Parts have to be connected visually, no floating stuff. Must have two rear lights emitting red. How you do it, I don’t care. It’s not required to make them look like real lights, just a glow on the inside of the rear quarter panels is enough. Moving control surfaces are not allowed except boost flaps. If you use boost flaps, they need to cancel out each other forces. SAS and RCS are not allowed. The jet engine is not allowed inside the passenger cabin. In case of a front mounted engine, the thrust vector is allowed to move through the passenger cabin. I don’t care how ugly it is. FAR or other modifications to the aero system are not allowed. Have the action window of the jet engine and resource window open at all times. Take a screenshot at start, after 5 minutes and after that at 30 minute intervals. Take a last screenshot when you’ve run out of fuel. If you don’t have/use Mechjeb, install a probe core so you’ll be able to show the distance to KSC when you’ve run out of fuel. The comms system needs to be enabled in the difficulty setting. a closed rear, with a small slit in the middle for the exhaust thrust vector. Suggested terrain detail level: low. Both KSP 1.2.2 and 1.3 have problems with terrain on high settings, I don’t know about 1.2.2 but the problems aren’t there in 1.3 in low detail mode. Suggestion: program a route with Mechjeb. Turn the car in the SPH so you’ll start in the right direction. Drive around the bay and head north, try to avoid the hills and mountains.